We are so proud of our partnership with the For Kids Foundation! This allows YOU to help kids in teens through your TAX DEDUCTIBLE CONTRIBUTION to a N.E.A.T. Scholarship fund! 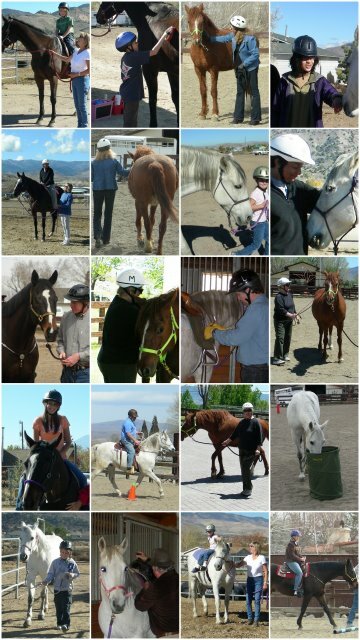 Through work with horses, N.E.A.T. provides social, emotional and behavioral growth and learning, as well as mental health interventions for children, teens, adults and even seniors. To donate, you can mail a check to: 834 Willow St, Reno, NV 89502 and put N.E.A.T. in the ‘for’ space on the check OR you can simply go to their website (https://forkidsfoundation.org/), or their Facebook page (https://www.facebook.com/ForKidsFoundation/ )and click on the ‘Donation’ button in the upper right hand corner and click in the box on the lower right side that indicates your donation is intended for N.E.A.T’s scholarship fund. 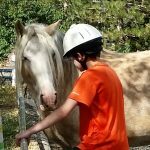 Your donations will help children and teens in Northern Nevada find a path to a happier, healthier and more productive life, through work with horses. Your TAX DEDUCTIBLE CONTRIBUTION will help kids and teens like ‘Samantha’. Samantha is the oldest of 5 children. She has always been ‘momma’s little helper,’ caring for her younger brothers and sisters when mom was busy doing other things and keeping them quiet when her father was in ‘one of his moods’. The family lived pretty rough when her parents finally split up. Samantha did all she could to help when her mom had to go to work. When mom remarried Samantha thought things might get better, but they didn’t. It started with her new step-dad being really nice to her, offering compliments and ‘cuddling’ with her, but that’s not where it ended. When Samantha tried to rebuff his attentions he threatened to leave the family or to pick one of her younger sisters to be his ‘favorite’. This went on for nearly a year before Samantha couldn’t keep it secret any longer and told a teacher what was going on. Her mom did not believe her and blamed Samantha when her step-dad was arrested. Samantha moved in with her grandmother, but was having a very hard time. She worried about her siblings, who still lived with mom and her grades fell. She became very withdrawn and had to be reminded every day to do simple thing to take care of herself. When Samantha first met the horses she spent a lot of time just brushing and hugging them. 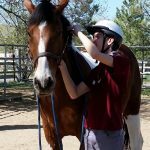 At first she worried a lot about whether they would remember her from week to week, but she has slowly built a strong bond with Mystic and is delighted when Mystic sees her and neighs a greeting. 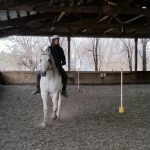 Samantha is slowly developing confidence and has begun to set appropriate boundaries so that she does not get stepped on or pushed around while working with Mystic. She has slowly begun to trust the human she works with too. The healing has begun. ON BEHALF OF THE CLIENTS WE SERVE, WE THANK YOU FOR YOUR KINDNESS AND GENEROSITY.